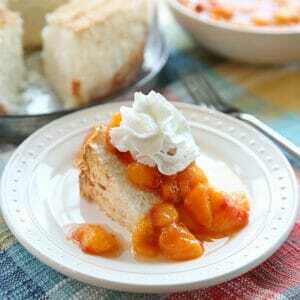 A beautifully light and fluffy cake, perfect for a variety of dessert dishes! Preheat the oven to 325°F. Don’t grease or flour your angel food cake pan. A 10″ round pan or an angel food loaf pan will fit this recipe well. In a mixing bowl, whisk together the flour and 3/4 cup of the sugar. Set aside. In the bowl of a stand mixer, combine the egg whites, salt, and extracts. Use the whisk attachment and beat until mixture is frothy, about one minute, and then sprinkle in the cream of tartar. Continue beating until stiff peaks form. Spoon the batter into the pan, and bake the cake for 40 to 45 minutes, or until it’s golden brown and the top springs back when lightly touched. Remove the cake from the oven, and set it upside down on the pan’s “feet” or if your pan doesn’t have feet- with a bottle through its center cone to keep its top from flattening on the counter. Let the cake cool for 1 1/2 hours.